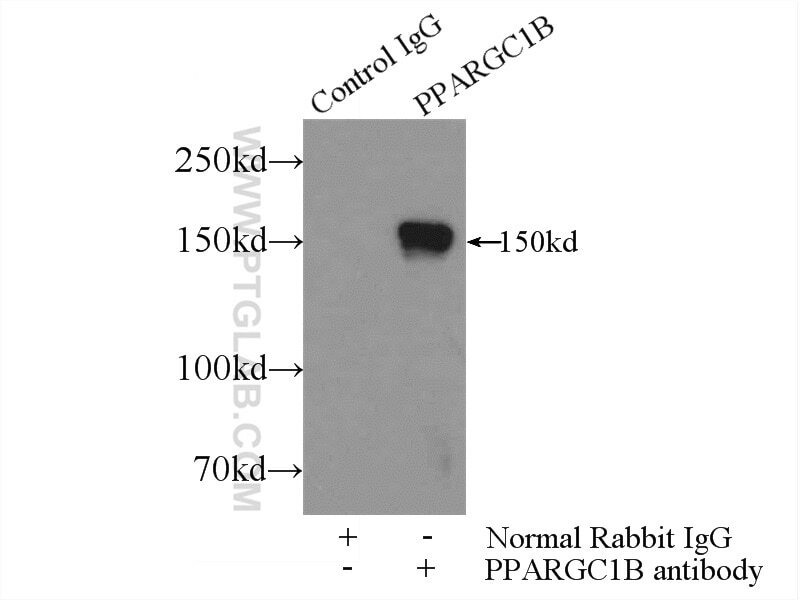 IP Result of anti-PPARGC1B (IP:22378-1-AP, 4ug; Detection:22378-1-AP 1:300) with mouse liver tissue lysate 4000ug. Hypolipidemic effect of oleanolic acid is mediated by the miR-98-5p/PGC-1β axis in high-fat diet-induced hyperlipidemic mice. Dietary leucine supplementation alters energy metabolism and induces slow-to-fast transitions in longissimus dorsi muscle of weanling piglets. miR-25 modulates triacylglycerol and lipid accumulation in goat mammary epithelial cells by repressing PGC-1beta. Benfotiamine, a Lipid-Soluble Analog of Vitamin B1, Improves the Mitochondrial Biogenesis and Function in Blunt Snout Bream (Megalobrama amblycephala) Fed High-Carbohydrate Diets by Promoting the AMPK/PGC-1β/NRF-1 Axis. Mitochondrial metabolism is inhibited by the HIF1α-MYC-PGC-1β axis in BRAF V600E thyroid cancer.